I just love this movie, and each time i see it, i get more chills than the previous time. This is a movie that keeps on working for me, at all levels. Yes, it is one of the great horror/thriller movies of all times, and as such, it's not for everyone. But if you can stomach it, it's quite an experience. The overall quality of this film is amazing. Every shot is superbly composed. The light is amazing. This is particularely worth noting. The cinematographer Darius Khondji does an amazing job here with a special emulsion process to enable this extremely high contract throughout the movie, while keeping an incredible amount of detail. The creepy corners in this movie are darker than anything else you have seen previously, without being grainy or lacking in details. He has worked on many other movies where cinematography has been equally impressive. Khondji honed his skills with French director Jean-Pierre Jeunet on films such as Delicatessen, Alien 4, Resurrection and Amelie. Khondji is the king of dark and deep cinematography and has worked again with Fincher recently in Panic Room. The cinematography is an integral part of Seven's dark tale. From the "Rain" scene where Brad Pitt gets his Cliff's notes, to the library scene where Morgan Freeman does some research. Throughout the movie, the macabre subject is always highlighted by the somber atmosphere projected by the images. The art direction also packs punches throughout the movie. The Sloth scene is simply amazing. I have never seen air fresheners create a mood so scary in my life. The final scene, in the desert, also stands out with the ominous presence of electrical power lines. And the music... the music. Have you ever heard a crescendo so powerful as the music set to the last scene. The tension mounts non stop for close to 15 mn with a single chord played over and over again, going up the scale in what seems like an infinite regression. If at this time in the movie you are not already totally spooked, this has to do it for you. I noticed that for me (it's pretty hard to scare me), i really got totally unconfortable in that last scene and it was because of the music more than the long exposition of Kevin Spacy's psychopath character which in itself reaches new heights of scary motive expositions. And what about the story. Well, i must admit it's not for everybody. Many people i know simply could not stomach the story and the twists and turns Andrew Kevin Walker (the writer) and Fincher treat us to. The macabre, malsain, subject matter is probably the reason why a film like Seven was not as well received as Silense Of The Lambs. To me, Seven is a much superior movie in all respects, but it is simply too edgy to get the widespread recognition that Silence got with its Oscars and all. In my book, this is the first real Fincher movie. It is with Seven that he affirmed his sense of the macabre, and his knack for incredible stories full of revellations, twists and turns. Fincher to me is the modern Hitchcock, and Seven follows in the tradition of great shockers such as Psycho. The story grabs you from the begining to the end, and leaves you with one of the most amazing revellations in film history, a one sentence moment with "What's in the Box!". To me, this is only rivaled by Darth Vador announcing to Luke Skywalker "Luke, i AM your father!" at the end of The Empire Strikes Back. So what's left to say about Seven? Well, the performances. Freeman, Pitt and Spacey are all breathtaking here. Even Paltrow (not my favorite actress) manages a wonderful performance here that is key to the grand finale. 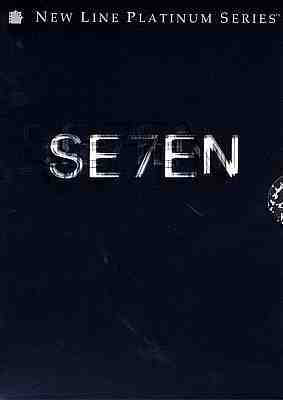 Seven builds an incredible atmosphere, created by a perverse (in the best sense of the word) script, an incredible cinematography and art direction, and great performances.